The REFERTIL project is organised into 10 work packages (WP) which coherently integrate knowledge and experience from 10 EU countries, which will reveal the possibilities of producing standardized, safe and economical compost and/or biochar, while meeting the EU EoW criteria. 1 Identification, sampling and quantification of the main urban organic waste and agriculture organic residue flows and logistic systems in the participating countries. 2 Development of a detailed pyrolysis technology and biochar product matrix database ranking the available biochar producing technologies. A biochar policy supporting report. 3 Development of a detailed composting technology and compost product matrix database ranking the available compost production technologies. A compost policy supporting report. 4 A microbiological strategy will be developed for fungus, bacteria and mycorrhizal fungi for compost activator and compost nutrient enrichment application incl. selection of inoculants and the development of inoculation technology. 5 Improvement of the biochar production and treatment process towards high quality standardised ‘end-of-waste’ quality biochar production and zero emission performance. 6 Composting process optimisation and product improvement for nutrient retention and emission minimisation, including identifying and proposing good operational practices and technological improvements. 7 Best available technology „BAT” demonstrations and trials will be conducted for improved and sustainable compost and biochar production including small scale microbial inoculum trials. 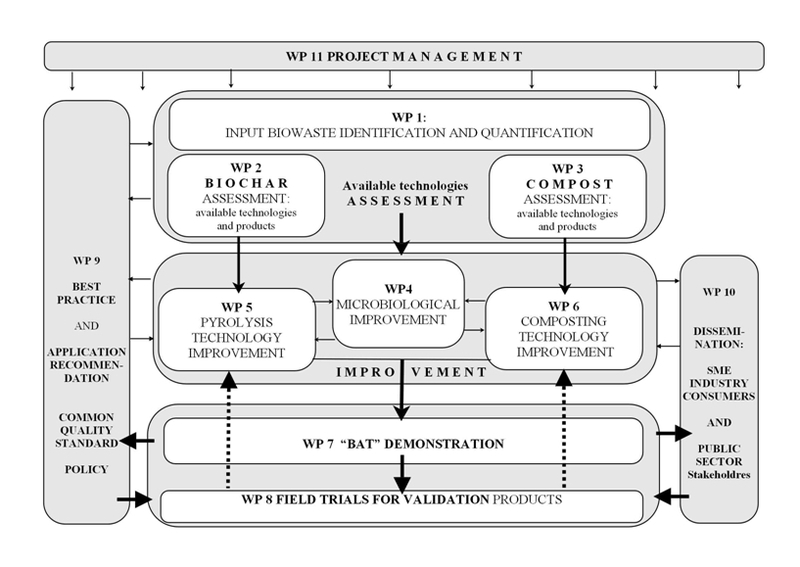 8 Validation of the improved technologies and recycled products against ‘end-of-waste’ criteria will be made with compost and biochar in field crop trials under different conditions, including environmental viability and safety evaluations. 9 Setting up a framework for common quality standard requirements and new application methods for biowaste treatments and compost/biochar products to guarantee a high level of protection of human health and the environment. 10 Extensive EU-wide dissemination and end-user involvement specifically for SME’s and farmers as end-users. A range of networking and field demonstrations will be established to reach as many stakeholders as possible.